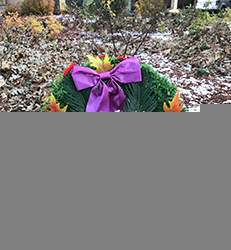 A wreath laid by CUASA Vice-President Doron Nussbaum on behalf of CUASA members at the Carleton Remembrance Ceremony on November 12, 2018. CUASA and Carleton representatives have moved to written submissions to Mediator Kaplan on the Minutes of Settlement interpretation affecting Instructor workload calculations. CUASA argues the new workload calculations should be retroactive to May 1, 2017, the start of the new Collective Agreement, while Carleton argues the calculations only came into effect upon ratification on June 18, 2018. We will be holding an Instructors’ Town Hall on Monday, December 17 from 4:00-5:30pm in C264 Loeb Building to provide an update on the situation. All Instructors are encouraged to attend. The signing of the new Collective Agreement has been postponed until this issue is rectified. Please note that the unsigned collective agreement will not be made available on the website until the signing process is completed. If members have questions, or need a copy, please contact Member Services and Communications Officer Josh Horton at joshua.horton@cuasa.ca. We are launching a new Member Engagement Survey to learn more about the needs and preferences of our members across the university. It should take you 5-8 minutes to complete. Please click here to access the survey. We ask that you fill it out no later than December 31. Thank you for your help in this! With January soon approaching, the first round of funds for computer replacements will soon begin. Each CUASA employee will be eligible for $1,500 toward the cost of a new laptop or desktop computer of their choice, with one-quarter of CUASA members being reimbursed per year. To be eligible for replacement, your existing computer must be at least four years old. Reimbursement decisions will be made by your Dean or the University Librarian, in consultation with Chairs, Directors and Department Heads. CUASA has learned that the University intends to prohibit incoming first year students from taking first year courses online. Students will instead be asked to take their first year courses in a classroom. CUASA encourages any members affected to inquire with their Chairs if their departments intend to implement this. CUASA would also appreciate direct feedback from its members on this topic, which you can send to cuasa@cuasa.ca. Please note the CUASA Office will be closed from December 22 through January 1 inclusive. No services will be provided during this time. The office will reopen on Wednesday, January 2, 2019. CUASA wishes to express solidarity with members of CUPE 910, representing Operational and Maintenance employees in Facilities Management and Planning, who will be meeting with the Employer in conciliation sessions on December 4 and 6. On November 15, the Ontario government released its Fall Economic Statement. Also known as the mini-budget, it offers insight into the government’s plans. OCUFA has prepared a summary of the most relevant announcements for the postsecondary sector, including an immediate suspension of all pending broader public sector executive compensation increases, an announcement of new pension implementations, and a further clarification of the free speech directive. You can read OCUFA’s summary here. The statement also included the government’s announcement that it is cutting promised funding for a francophone university. On November 13, CUASA President Root Gorelick joined faculty from across the province for OCUFA’s Advocacy Day at Queen’s Park. The event introduced new MPPs to faculty priorities, including public funding for postsecondary education and fairness for contract faculty. You can read more from OCUFA here. You can read President Gorelick’s report here.